Grain storage is essential to any grain operation in Alberta. Since commercial grain handling systems in western Canada cannot store the entire grain crop. Grain storage is used as part of a grain marketing strategy. Grain prices tend to be the lowest at harvest and it makes sense for it to be stored until prices rise later in the year. The choices available for storing grain are abundant. The 2013 crop year experienced record production as seen in figure 1. Rail transportation backlogs also occurred due to weather and competition for rail resources. This led to increased interest in on farm storage. Storage options are either permanent or temporary. Producers are also looking at storing on farm fertilizer which has increased the need for added and diversified storage. This paper will identify options for grain storage and the associated costs and benefits. As grain production in the early 20th century was developing in Western Canada the need for grain storage was essential. The iconic grain elevator began to dot the countryside. 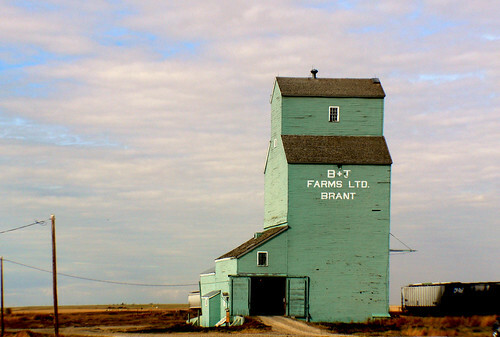 Alberta’s first grain elevator was built in 1895. As there was very little on farm storage and farmers relied on grain elevators to store and hold their grain until it was shipped by rail. In 1934, the highest number of elevators were recorded. Alberta had 1,781 elevators and Western Canada had 5,758 elevators. In the 1940’s and 50’s additional temporary and permanent storage was built in or near existing elevators. The minimal on farm storage producers did have, were wooden buildings that were susceptible to rodents and weather damage. In 1926, Western Steel Products Limited (now known as West Steel) designed the first corrugated steel weatherproof granary, which began to dot the western Canadian prairies. In the late 1950’s the consolidation of delivery points started to occur and larger wood elevator facilities were built. In the 1990’s grain companies concentrated on building large concrete silos that were designed as high capacity, high throughput terminals. The larger elevators serviced larger areas and more farmers. The availability of commercial elevator storage became limited. Many wooden elevators were sold to producers for personal storage, adapted for bulk fertilizer storage, torn down or turned into a museum. By 2017, there were only 352 operational country elevators in Western Canada and 79 in Alberta. Despite the reduction in elevator numbers these elevators become increasingly more efficient. As of 2012, the average western Canadian elevator turnover rate was six turns a year, in 1999 it was less than five turns. As grain elevator storage became more limited, farms were getting larger, yields were increasing and on farm storage facilities were deteriorating. Farms needed to invest in more efficient on farm grain storage. Grain bin prices have been climbing over the last 10 years. Figure 2 shows that prices have increased from $2.50 a bushel in 2004 to over $4.00 a bushel in 2011. Prices have decreased in 2012 but have been trending higher in late 2017, bins values matched the 2011 prices. Steel (both corrugated or smooth walled) grain bin prices are driven by demand and steel prices. Producers are looking at other permanent and temporary alternatives to grain bins for reasons of cost and portability. According to Statistics Canada March 2017 survey, Alberta has approximately 27 million metric tonnes of permanent on farm storage capacity and approximately 9% of the total grain was in temporary on farm storage (Figure 3). This shows that producers are using both temporary and permanent storage options on their farm. Generally in years of normal production, prices are seasonally lowest at harvest. This is due to a large supply of newly harvested crop putting pressure on the grain handling system. Grain, oilseed and pulse users require crop over the whole year. 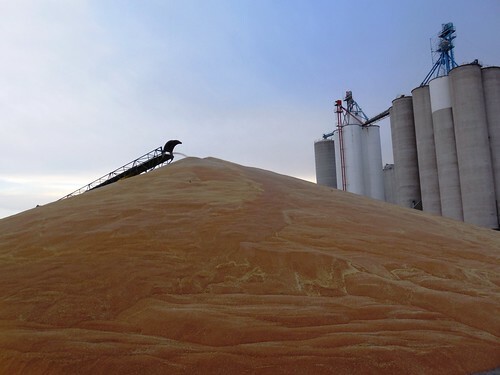 Storing grain over a short-term following harvest (three to four months) can improve returns and provide product at times when deliveries are slow. The longer grain is held, the more expensive storage becomes. Only in the event that there is a general price rise throughout the crop year does long-term storage pay. Deciding on a storage option depends on the financial situation of the farm. Things to consider are the cost of the buildings, maintenance of the system, the opportunity costs of receiving sales proceeds from the crop, using the money to pay debt or invest, storage payments offered by the grain handling company and the impact of the changing basis levels on cash prices. Farm storage is used as a marketing tool and can increase farmers’ net returns, however if stored too long or sold at the wrong time storage can be costly. . The decision to use either permanent or temporary storage is unique to each individual’s situation. Generally permanent storage is preferred to maintain grain quality and for the ease of use. That said, some temporary systems are becoming popular due to their flexibility. There are two main types of steel bins, corrugated steel and smooth walled steel. Smooth walled bins have a higher upfront cost than corrugated. They can be used for both fertilizer and grain storage and have minimal assembly costs. Smooth walled bins come with hopper bottoms and are quick and easy to install. Corrugated bins are more economical and come in larger capacities than smooth walled. Corrugated bins can be placed on a hopper bottom or on a flat bottom concrete base. Either corrugated or smooth walled bins allow for aeration and permanent handling options. Brands, sizes and additional options can be purchased for either corrugated or smooth walled bins. Prices are dependent on the bin size and options. Larger bins normally have a lower investment per bushel, but lack long-term flexibility. Grain quality is more difficult to manage in a larger bin. With smaller bins, one can reduce the risk of jeopardizing a large volume of crop if a storage issue occurs. Maintenance for grain bins is minimal. They should be cleaned when empty, inspected for insects and repairs made when needed. Some things to look for are corrosion, loose bolts, foundation cracks and seals. Any mechanical equipment should have the dust removed regularly and electrical equipment should be inspected for damage. If using smooth walled bins for both fertilizer and grain, the bin should be pressure washed on the inside after fertilizer use, to remove the dust. With proper maintenance, there will be minimal wear and tear and an increase in the lifespan of the bin. Sheds are another option for grain storage, they can be made of either steel or fabric. Concrete floors are beneficial for moisture barrier and cleanup. If there is no concrete floor a moisture barrier should be laid down. Sheds hold less grain than expected as they can only withstand minimal weights on the sidewalls. Grain packages can be purchased for sheds that will reinforce or tie together the walls allowing for a higher load capacity. For fabric buildings, concrete sidewalls need to be poured to allow grain to pile against them. Adequate aeration is difficult to achieve in a shed and roof vents are required to allow for ventilation. Fabric buildings are more economical than steel sheds, but have a shorter lifespan. An operation would choose a shed to store grain if storage is infrequent and the shed can be used for other purposes when not storing grain. In the 1990’s grain companies consolidated grain terminals and built large high throughput concrete facilities. Small wooden grain elevators were torn down or sold. In some cases, a producer might purchase a wooden elevator for grain storage. This system works if the land being farmed is within close range of the elevator. Additionally, grain elevators require a tremendous amount of maintenance and upkeep as many of the facilities are quite old. The opportunity to purchase an existing wood elevator is limited. Includes any system that holds grain on a temporary basis or has a limited life span. These include grain bags, plywood or steel bin rings with tarps, piles and bunkers. Grain bagging systems are a newer technology. The system puts grain into a tightly sealed plastic bag. For it to work you need a bagger, extractor, and bag. Bagging systems keep grain airtight from moisture and pests. Bags are good short-term storage options but if stored for too long damage to the bag can occur and spoilage can result. Bagging systems allow for in the field storage, eliminating trucking during harvest. In some situations, high moisture grain can be stored in grain bags with minimal heating and rot damage. Grain bags are at a high risk of having puncture holes from wildlife, mechanical damage (snowmobiles) or trees. Due to this risk, bags should be monitored for damage and repaired regularly to reduce grain spoilage. Some options to reduce bag breakdown include using a thicker poly bag or installing reusable bag covers. Bags usually hold approximately 10,000 bushels so small volumes of grain do not work well for this system. Bags should be placed in a well-drained area away from trees or other potential sources of damage. The surface needs to be level and smooth with no stones or sharp objects. Picking an area that is accessible in the winter also needs to be considered. Grain baggers and extractors require yearly and seasonal maintenance. The bagger and extractor have hydraulics, moving parts, augers and tires; regular inspection and greasing of all the parts should be done. With wear and tear on baggers and extractors, parts may break and need to be replaced. Equipment in good working order will capture a good resale value but as the equipment ages and new technology comes on the market equipment can become obsolete. Disposing of the plastic once the grain has been removed can be an issue. Few municipalities have recycling programs in place and if so, require the plastic be clean and rolled. Some extractors have built in rollers but others do not. Rolling the plastic is time consuming and difficult to roll tightly. For municipalities that do not have recycling programs they may not accept plastic or charge a tipping fee. Burning plastic is not recommended as it is hazardous for human health and the environment. Grain rings and tarps come with either wood rings or steel rings. This system is useful for temporary storage, but not recommended for longer storage periods. Pest, wildlife and moisture damage are the biggest concern when storing grain in this system. By keeping the grain contained in the rings and using a tarp, grain quality can be maintained much better than open piling. To keep the rings and tarps in good condition they need to be dismantled and stored when not in use. If using steel rings, the tarps usually need to be replaced well before the ring wears out. Wood rings are much more economical, but have a shorter lifespan than steel. Aeration holes and in-load out-load ports can be installed into the ring as an option. A bunker system can be designed with many different materials such as bales, wood, cement, steel and earth. They have some of the same challenges as grain rings and tarps. These systems are for temporary storage and are susceptible to wildlife, insect and moisture damage. Large amounts of grain can be stored in a bunker and most bunkers can be tarped. If grain needs to be stored for an extremely short period of time, uncovered open piles are a low to no cost solution. This system is not recommended for longer-term storage as it has no protection from moisture, wildlife and pests. There is a greater chance for grain to spoil and to have contaminants such as animal feces and soil tag. Most grain that would be stored on the ground would be used for feed as human consumption grain would lose quality very quickly by being stored on the ground. Having rented or leased land can make grain storage complicated. If the lease is temporary, adding permanent storage may not make sense. Bin space may be rented from a neighbour, landowner or local retired farmer. Having a rental agreement in place and clearly marking the rented bins as to the variety and owner of the grain. This will alleviate any confusion as to who owns the grain. Equipment such as grain extractors can be rented for grain bagging systems as opposed to investing in the equipment. Figure 13 shows the most common permanent and temporary storage options with average costs, size ranges, lifespan, maintenance and options. Every growing season is different and it is hard to anticipate the exact storage needs for the farm operation. Investing in grain handling and storage facilities require careful consideration of both current and future storage capacity needs. Looking at future plans for the entire farm will assist in your storage decision. The decision as to what system or combination of systems to use can be overwhelming. Taking the time to pencil out all factors can assist in making a sound investment decision. Along with the purchase price, other factors such as setup costs, site prep, labour and type of physical storage system needs to be considered for the total project cost. Depreciation is an important aspect when determining costs. Depreciation is generally considered to be the result of aging, wear and tear, and obsolescence. It represents a decrease in the potential economic benefits that can be generated by the capital asset. This is very important in determining which system is the best for an operation. Repairs and maintenance are also key to the decision, since some storage systems are relatively maintenance free while others require a lot more upkeep. Even if the option chosen has the most economical purchase price, it may have the highest maintenance and repair costs. Financing interest is also important to consider. If the investment in a storage system has a high upfront cost and money needs to be borrowed, a substantial amount of cash can be lost to interest. The high cost of interest on a system may not make sense for some operations. As well, the lost opportunity of using that money for an alternative investment needs to be considered. Certain storage systems are more prone to spoil grain, while others, if managed properly, will provide relatively unspoiled product. Expected loss should be calculated into the total cost of the system. Figure 14 is a comparison of five different storage options, based on the following assumptions. This example assumes the operation needs to add 25,000 bushels of storage. The grain bin and ring and tarp held a capacity of 25,000 bushels while grain baggers have unlimited storage capacity by adding more bags. The bins are five, 5000 bushel steel bins with corrugated hoppers, corrugated flat bottom and smooth walled bins with hoppers either on a gravel or concrete base. Insurance, energy, labor and tractor requirements were equal for all storage options. Augers are already an asset on the farm and require no additional investment. Aeration systems have not been installed for any of the options. The years’ of use was calculated using an estimated life expectancy. Grain bins can expect a 30-40 year life span with proper maintenance. Depreciation was calculated using Canadian Revenue Agency classes of depreciable property. Since this is an example to analyze costs, it is best to calculate for each individual farm and situation. This example shows that grain rings and tarps are the most economical solution for grain storage. Unfortunately this system can only be used on a temporary basis as there is a high risk for pest, wildlife and moisture damage and loss. As well, these systems require more maintenance along with assembly and disassembly every year. This increases the work load for the operation. Grain bins are the second most economical option. The smooth walled hopper on concrete is slightly more expensive corrugated flat bottom or corrugated hopper bins. This is due to the higher initial investment and extra interest. The grain bagging system is the highest cost for adding 25,000 bushels of storage. This was due to the high investment cost for the bagger and extractor along with high spoilage, depreciation, and low salvage values. Since grain bagging systems have unlimited storage capacity, the cost per bushel over the lifespan of the asset decreases the more bushels being stored. Grain bagging systems become competitive when more than 70,000 bushels of product are stored per year as shown in Figure 15. When accounting for depreciation, spoilage, interest, repairs and maintenance, an operation can evaluate the entire cost of the storage options under consideration. The cost comparison is only one factor when deciding which storage option works best for an operation. Other considerations include the farm’s future plans, existing systems and labor availability. Grain storage has evolved over the last 150 years, most producers rely on on-farm storage for marketing grain. The most popular permanent storage options are steel grain bins and the most popular temporary storage are grain bags. There are downfalls to grain bags and to make the system economical a large volume of product needs to be stored each year. There are other economical grain storage options besides bins or bags, but the risk for damage by wildlife and spoilage are high. Deciding on which system to use is dependent on each farm’s circumstances. The needs and future plans of each farm need to be analyzed and considered before deciding the best grain storage option. Saskatchewan Ministry of Agriculture. February 27, 2013. Bins vs Bags What Does It Cost? For more information about the content of this document, contact Ryan Furtas. This information published to the web on February 18, 2015.